With a purported 700+ million users, spending upwards of 700 billion minutes per month, with at least 130 friends, in the form of 90 pieces of published content per day, Facebook is now a formidable component of how people spend their time online and via mobile devices. The relaxed, word-of-mouth social networking site has become a key place for businesses to market their wares and connect with their stakeholders, and it has spawned a new phenomenon that’s been given its own term “f-Commerce” (short for Facebook Commerce). The actual Facebook + Commerce mission is about “helping commerce partners use Facebook to create social and personalized shopping experiences” by sharing best practices and tools to help businesses increase registration and conversions, drive referral traffic, and deepen user insights on your site. Over the next few blog posts, I will break down in real terms, the potential that you have as a small business for using Facebook as a sales medium. Come back each week as we explore each topic. 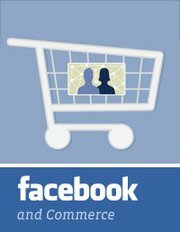 Have you tried f-commerce (Facebook Commerce), what’s been your experience?